Steve & Judie Evans have been in business for 20 years. Steve started out as a fishing guide on Smith Lake for 8 years and then decided to open a sporting goods store. In 1999, they decided to add boats to their current inventory and later Steve became a certified mechanic and a master technician with Evinrude. Evans Marine has fully trained technicians to meet all of your needs for boats and engines. 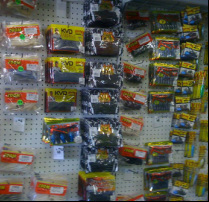 The store is fully stocked with marine parts, boat accessories, fishing tackle and more. Come by and see us today!